Call 910-210-0309 to schedule your first appointment. 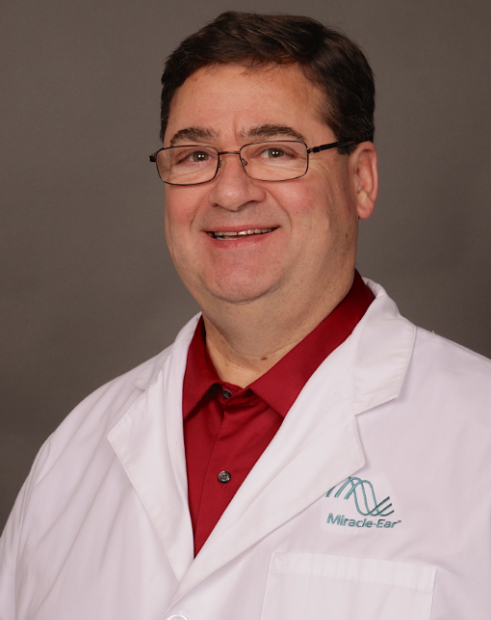 If you need hearing aids in Jacksonville, NC, look no further than Miracle-Ear®. Our specialists are eager to assist you in finding a hearing solution that works for you. We have a wide selection of hearing aids available. Miracle-Ear is America's most recognized brand of hearing aids, and we have over 1300 locations throughout the country. Each of our locations is independently owned and operated. Our hearing solutions, including our GENIUS™ Technology, incorporate innovations that lead the industry. GENIUS™ Technology can assist you in recognizing speech in challenging listening environments. Directional Focus technology allows users to focus front and center while blocking noise around them. VoiceTarget technology zeros in on conversations in any direction. Wireless Windscreen allows sounds to come through more clearly by removing noise pollution from the wind. These features work in sync with each other and adapt smoothly to changes in the acoustic environment. The GENIUScontrol app* lets users change volume, hearing programs, bass, and treble directly from a phone. It sends a frequency signal directly to the hearing aids without the need for extra hardware. The app works with all hearing aids equipped with GENIUS™ Technology and is free to download. Some are more appropriate for significant hearing loss, while others are more appropriate for milder impairment. Some styles could match a user’s skin tone for discreetness. Miracle-Ear® products can benefit your hearing in more ways than one. If you’re in Jacksonville or Tarawa Terrace, call us today or stop by our hearing aid center for more information. When you choose us, you can expect continuous care and support. We do hearing aid repairs and provide ongoing checkups. We’ll replace batteries and clean hearing aids, inspect your ears for wax, and see that your hearing aid fits well. We hope you’ll come discover and experience the Miracle-Ear® advantage. Travis Martin is a licensed Hearing Aid Specialist and a member of the International Hearing Society. Travis has been a Specialist in the Jacksonville area for over 4 years, and brings a tremendous level of empathy for those who have experienced hearing loss. Travis is very active in the Jacksonville community, a member of the Chamber of Commerce and an active participant in various health fairs and Expos. Travis also makes frequent visits to Jacksonville area assisted living and nursing home facilities to provide hearing health services to those who have difficulty in traveling to his office. In addition to being a licensed Hearing Aid Specialist, Travis is also an ordained minister, with a Master's of Divinity from Reformed Theological Seminary in Jackson, MS. Travis' background in ministry adds another dimension to his ability to understand the problems of the hearing impaired. Travis states: "I receive tremendous satisfaction from the joyful quality of life my patients experience when hearing and understanding are improved. My goal is to be exceptional in this "Ministry" of Hearing Healthcare". Faith Titus began her tenure as a PCC for Miracle-Ear in 2014 and comes from a managerial background in retail pharmacy. She is passionate about hearing health and serving her community. In her own words: "I love helping my customers in any way that I can. I truly enjoy helping people hear better." Outside of Miracle-Ear, Faith enjoys spending time with her family and pets. She has one daughter named Sarah, who lives with her husband in New Bern. She also has a cat named Kalie, with whom she shares her home here in Jacksonville with, and is a proud grandmom to 3 adorable grandcats. Faith is excited to meet you at the office in Jacksonville to help you begin your journey to better hearing. I have been serviced by Miracle-Ear for many years. I have been knowing Mr. Martin for quite a few years. He has been seeing me and taking good care of my needs. His service has been very good. I enjoy going to visit his office. I enjoy his company. I also appreciate his secretary (Faith). She also calls a day ahead of my appointment. I like the service. Since I have gotten Miracle-Ear hearing aids, my hearing has greatly improved. I don’t have to turn the TV up as loud and having conversations with others is so much clearer. I can hear what people are saying now. If you are having hearing problems, call Miracle-Ear and schedule an appointment for a free hearing test. It could make a wonderful difference in your life.